The Royal Academy of Performing Arts was formally established by our late third King Jigme Dorji Wangchuk in 1954, with the gracious intention to preserve and promote the Bhutanese Mask dance, folk dance, and music. 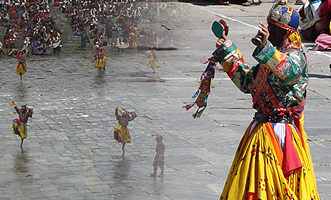 Since its inception, the academy introduced courses on the three categories; Mask dance, folk dance, and music. 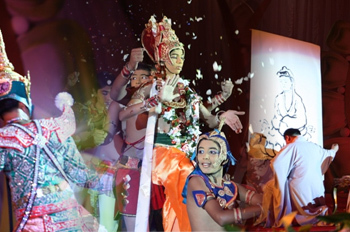 Currently, it is one of the premiere institutes in the country under the Ministry of Home & Cultural Affairs. Therefore, we strive hard to preserve and promote our cultural heritage which is one of the four pillars of the Gross National Happiness. 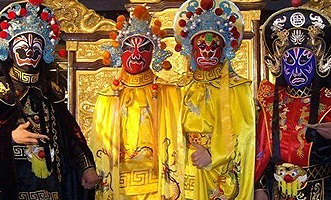 The performances will be four sections; they are Chinese martial art performance (similar to SHAOLIN GONGFU), Sichuan drama of changing masks (very popular in china), Buddhist songs and Chinese Buddhist tea ceremony. Shomyo is chanting of melodized Buddhist sutras on the occasion of Buddhist ceremonies. It is thought to be the origin of all Japanese music. Shomyo was born in India, the birthplace of Buddhism. It was passed on to China and then to Japan with Buddhism, and there it took a hold. The place recognized as the cradle of Shomyo in Japan is Ohara in Kyoto, where the famous Sanzen-in Temple is. It is recorded that Shomyo was performed in the consecration ceremony of Daibutsu, the giant statue of Buddha, of Todai-ji Temple in 754 in the Nara era, and judging from it, Shomyo had already prevailed in the Nara era. Early in the Heian era (794 � 1185), Saicho and Kukai brought Shomyo from China to Japan respectively and laid the foundation of Tendai Shomyo and Shingon Shomyo. Buddhist denominations other than Tendai and Shingon have their own Shomyo and they still carry it on. Tendai Shomyo founded by Saicho has been developed uniquely. In 1109, Rev. Ryonin founded Raigo-in Temple in Ohara, Kyoto and gave it the title "Gyozan (Fish Mountain)" after Gyozan in China where Shomyo in China started. Shomyos of Yuzu-nenbutsu-shu denomination, Jodo-shu denomination, and Jodo-shin-shu denomination are of lineage of Tendai Shomyo. Ohara Gyozan Shomyo Kenkyu-kai hosted by Late Rev. 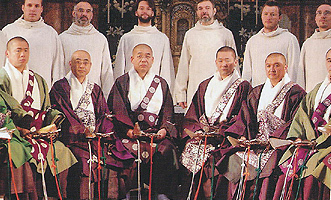 AMANO Denchu (1025 - 2002), who was the chief priest of Gyozan Jikko-in and made efforts to restore and carry on the orthodox Gyozan Shomyo, introduced Tendai Shomyo to the world for the first time in Czeckoslovakia in 1998 in collaborative performance with Schola Gregoriana Pragensis. A central element of Korean Buddhist culture, Yeongsanjae is a re-enactment of Buddha's delivery of the Lotus Sutra on the Vulture Peak in India, through which philosophical and spiritual messages of Buddhism are expressed and people in attendance develop self-discipline. 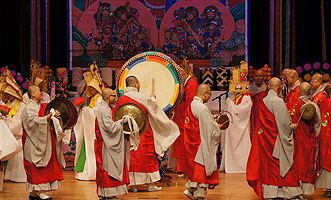 Yeongsanjae begins with a ritual reception for all the saints and spirits of heaven and earth and concludes with a farewell ritual representing manners of the otherworldly realm of Buddha, with singing, ceremonial adornment and varied ritual dances such as the cymbal dance, drum dance and ceremonial robe dance. The other components include a ritual cleansing, a tea ceremony, the dedication of a rice meal to the Buddha and Bodhisattvas, a sermon inviting the audience to the door of truth and a ritual meal for the dead to congratulate them on their entry into heaven. Preserved chiefly by the Taego Order of Korean Buddhism based in Seoul, the Yeongsanjae is held in temples throughout the Republic of Korea to help all beings enter the world of truth by worshipping and admiring the Buddha and his laws and monks. The ceremony serves as an important space for transmission of values and art forms and for meditation, training and enlightenment. Yeongsan of Yeongsanjae is a shortened word of Yeongsanhoesang. And Jae of YeongsanJae came from the word of Uposadha in Sanskrit with the meaning of offering ceremony among monks. When Buddha preached in Mt. Yeongchwi all audiences, hosts of other terrestrial and celestial beings, and out-guards were went into great ecstasy upon hearing the sermon as well as Sakradevanan Indra of entire universe, many Bodhisattvas, gods and goddesses. Mandara flowers were floating down from the heaven. Myoeum Bosal [Bodhisattva] as well as heavenly boys and girls came down to earth to dedicate flowers and incenses with music and dance to Buddha. All these divine spectacles are summarized into a ceremony, Yeongsanjae. In Yeongsanjae Namudaeseong-inrowang Bosal [Bodhisattva] guides the ceremony of the day in the temple. The purposes of Yeongsanjae are to teach the emancipation from rebirth and the new life in the heaven to the deceased, to remind the public of Buddha's teachings and to encourage their belief with all present revivals of Yeongsanjae in Buddha's time. It helps all living creatures to form a connection with Buddhism and to get a salvation from Karmas and enlightenment. Sujata, the daughter of a rich man by the name of Senani, on coming of age, had prayed at the foot of the bodhi tree thus: Guardian Deva of the bodhi tree, if I am married into a rich family of the same caste, I will pay homage to you with the offering of Ghana milk-rice". The prayer of Sujata had been fulfilled. So the rich man's daughter, Sujata had been paying homage to the Guardian Deva of the bodhi tree with Ghana milk-rice on the Full-moon day of Vesakha, the day on which the Bodhisatta was to attain the Buddhahood. 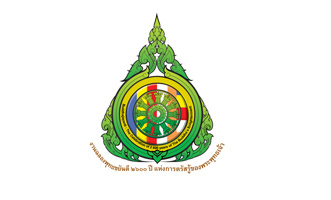 In order to celebrate the Vesak Ceremony 2012, Vietnam Buddhism University is planning to organize a Music Performance which will be presented by the Royal Art Performing Delegation of Hue-Vietnam.the theme of the performance is "Vietnamese Traditional Music and Dance for 2600th Anniversary Vesak"
. The Vietnamese Cremmonial Music and Songs has been recognized as one of the mankind Masterpieces of the Oral and Intangible by Unesco. 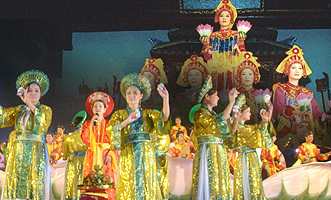 Lantern Dance (The Six Gifts Offering Ceremony) originated from a Vietnamese Traditional Music and Dance for Buddha Enlightenment. The traditional Dance describe six kinds of Offerings to the Buddha such as Incense, Light/Candle, Flowers, Tea, Fruits and Music. This ritual ceremony has been advanced by Hue Dynasty to Noble dance in form of Lantern Dance. 1-	Three wheels and nine variations: music is sounded to invite angels gather at place of ceremony and witness for the ceremony. 2-	Buddha Happy birthday music: The song/music to celebrate the birth of Buddha.